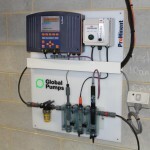 Global Pumps is an authorised distributor of the Prominent products. ProMinent is manufactured in Heidelberg, Germany. Prominent has great expertise in dosing equipment and systems for chemical fluid metering and monitoring. Global Pumps stock and distribute these pumps.